The dresser is beautiful, the color is light enough to be feminine but you can add boy colors and it looks great too. Received with a small defect on the top of the dresser, Overstock took care of it immediately and shipped a replacement part. Inspired by classic architectural trends, the Avenue Greene Lundy 3-Drawer Dresser and Topper speaks to a simple, elegant and timeless design. 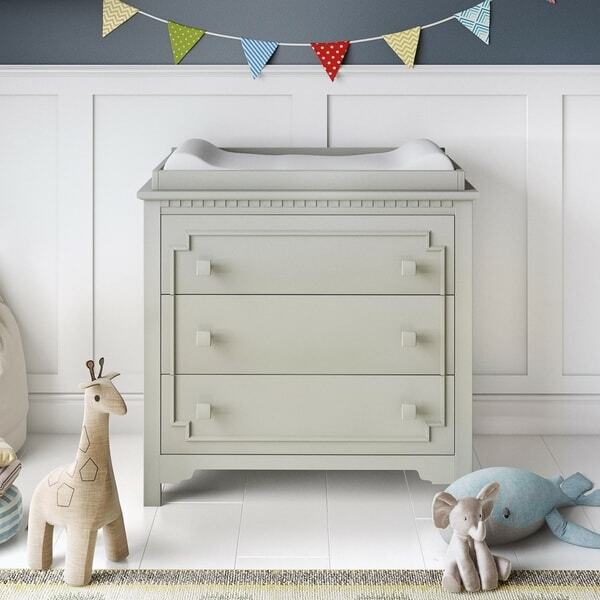 This 3-Drawer Dresser offers ample storage for your nursery and comes with a removable Topper that fastens securely to the dresser creating a convenient and spacious changing station. The Lundy 3-Drawer Dresser features a beautiful design with delicate applied molding in a step pattern on the drawer fronts creating a soft, yet bold profile. Subtle accents like the dentil molding and the pyramid shaped solid wood drawer knobs add depth while the sturdy wood construction and post style legs offers strength and durability. For a sophisticated look with updated stylings, combine the Avenue Greene Lundy 3-Drawer Dresser and Topper with the Avenue Greene Lundy 5-in-1 Convertible Crib to bring clean, modern charm to your nursery. Dimensions 19.5 In. X 37.88 In. X 37.75 In. Love love love this dresser! I bought this for my first baby arriving in June and it’s so beautiful. I also bought the matching crib and both look amazing together in the nursery. The color is beautiful as well. "Will you be getting the white in stock anytime soon? " How to Arrange Baby Nursery Furniture from Overstock.com. Our guides provide customers with information about how to arrange baby nursery furniture.